In Vermont, take exit 7. Go west on Rt 11 for 3.7 miles into Springfield. At traffic light, turn left. At stop sign, turn right. 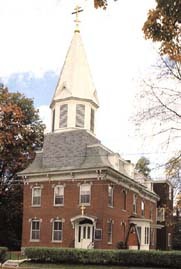 Church is at the top of the hill on Park St.
For a complete listing of services, please visit the “Schedule of Services” link on the parish webpage. Founded in 1905 by St Alexander Hotovitsky, Priest-martyr, Holy Trinity Church was also the site of the Russian Orthodox orphanage in the early part of the 20th century. In the 1970’s and 1980’s the parish underwent spiritual and liturgical renewal. Several families joined a church that had been kept alive for decades by a group of very faithful parishioners. A new altar and beautiful iconostatis were installed in the early 1980’s. A social hall and kitchen were built in 1997. This recent added space has greatly enhanced the life of the community allowing for more educational programs and social events. Other building renovations are being planned. The parish has become home to many summertime Vermont residents. Okemo and Mt. Ascutney resorts are nearby. All services are in English. The parish always welcomes visitors and seeks out those who desire to know more about Christ and the Orthodox Church.